I looooove decorating & have always tried to do so on a budget. In college & after, decorating means anything that's cool creating an eclectic feel in my decor. I've never been one to spend $$$ on decor because I like to change it up a lot & really want to afford other things too. So far I think I've made our bedroom look $$$ for $$. The mood board below doesn't do the idea justice. I'm still waiting for things in the mail & actually had to contact Amazon to change the address on one of my orders because I accidentally had the old address still on there! So hopefully it will arrive, correctly, soon. Zach already has a tall dresser, a short & long dresser, & a night stand from his old apartment. He's also got a queen sized bed + a few lamps. The biggest thing we were facing is finding a matching nightstand + dressing table for me. You may remember from all the past posts that the biggest thing for us is agreeing on decor. We both have totally different tastes but as we're getting acclimated I'm excited to open up my design aesthetic to include classier elements. Does that make sense? Less bohemian more classic-meets-modern. Damask Duvet Cover - This took a lot of deciding on! But luckily we found one we liked enough on Amazon for cheap. Amazon has been a great resource for affordable decor. We've bought the sheets, the duvet, & towels for the bathroom. Luxury items on sale, I'm telling you! This damask pattern also brings in a sort of rococo feel to the room adding to the modern-meets-classic feel. Floor Length Curtains - The curtains were the first elements of the bedroom I got. I just needed to start decorating so I headed to Big Lots & found super affordable yet really luxurious sheer curtains. To create a more luxury feel, I got one textured panel & swept it to the side with a small tassel. We also have small windows so i brought the curtains all the way to the floor. I have to say this is by far my favorite part of the room right now! Camera Prints - While reading through some blogs I stumbled upon some great camera prints in black & white. While we aren't trying to create a camera themed casa I'd like to try to tie in all of our collections across the board. My biggest fear is that our house becomes laid out like a museum with each room being a different theme. My hope is to accomodate all of our collections across the house. Creative Elements - I'm excited to throw in a bit more of me into the style of this room. While I like all the elements it really doesn't scream me. Me would have bright colors everywhere & a bohemian mix of styles but I think adding a crocheted blanket & decorating my dressing table/nightstand will give the room more of a me feel. I've got a lamp to paint & lampshades to dye so as long as there's something creative I think I'm satisfied. I am so very happy we went away from a black & red bedroom and moved onto purple. The lampshades are all going to be a lovely plum color as well as the crocheted blanket. lamps - both of us already have lamps, mine needs to be painted & it was a gift! camera prints - printed at stables & I've got some 12x12 inch frames to use. Maybe we'll print them here! I want them to look kind of distressed anyway. We also currently don't have a bedframe. Zach didn't have one & the way our bed room is laid out one can't really fit. The roof slants & any ones we see have too high of a head board. Eventually we may build our own but for now I think I've found a solution. While it's not ideal, I've decided to put a black fitted sheet on the boxspring so it doesn't look so tacky. I've been sort of channeling a look like this with a twist of this. I think (& hope) it looks sorta so comfy & beautiful you just want to fall in. I love all of your choices! 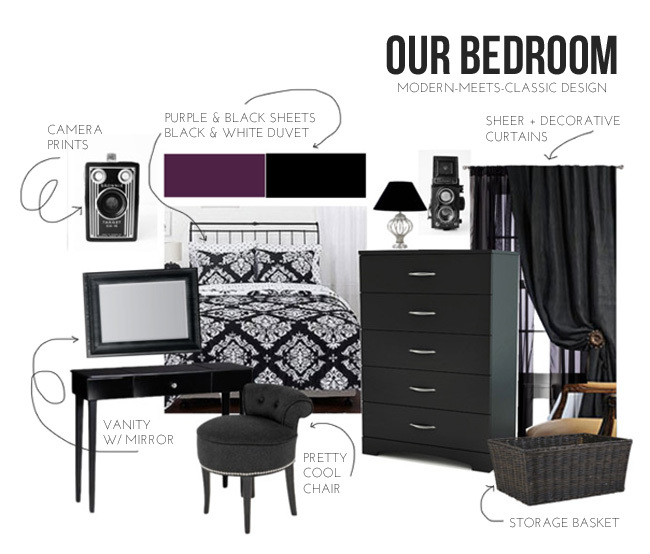 I'm working on a rehaul for my bedroom too, all with thrifted items of course. :D It'll take more time and paint, but I'm looking forward to it.